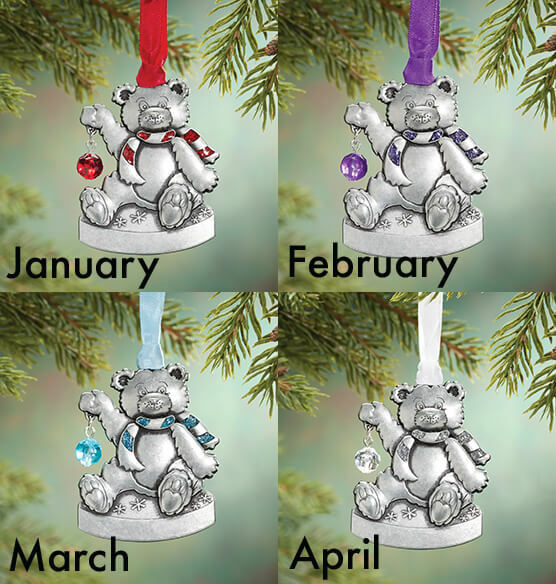 Our shiny personalized pewter birthstone bear ornament celebrates any birth month in a big, fancy way—donning a faceted birthstone bead, matching sparkly scarf, even a birthstone-colored ribbon for hanging! We’ll add to the fun by engraving any name to this beautifully detailed Christmas ornament, creating a one-of-a-kind Christmas gift for one special boy or girl. Specify month. Specify name; limit 1 line, 10 letters/spaces. Pewter-finish metal with acrylic bead. 2" long x 2 1/2" wide. Too costly for what they are, but cute anyway. This year I would say by far was the cutest, well made sturdy ornament I have gotten, so pleased. Love the bear ornament that I purchased for my son's first Christmas! Even had it personalized with his name. These ornaments I ordered for my two grandbabies. They were shipped pretty quickly and I love the way they turned out. Cute Christmas tree ornament, intricate detail. Beautiful Ornament!...great price...fast shipping for free!...customer for life! This product makes a perfect stocking stuffer. 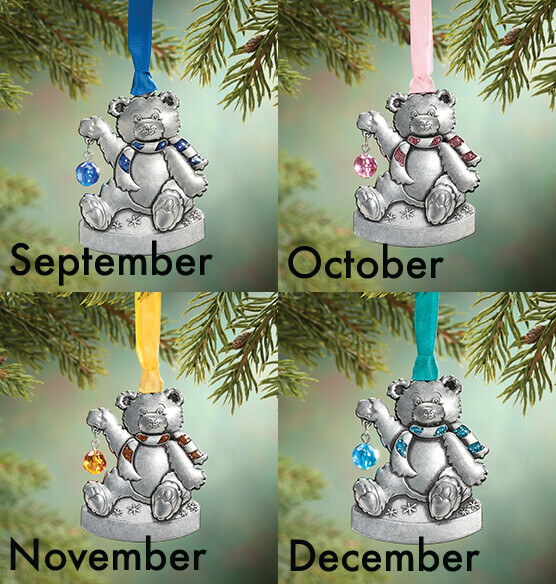 The bear is cute and colorful with the birthstone gems. The engraving is adequate, and for the price, it's a very nice ornament. I love ordering xmas ornaments for the kids every year. I have been able to get different one to suit the family members have love every one that I have gotten so far and I have not been disappointed with any of my purchases through the years. Always buy grands ornaments for Christmas. I bought three of these and I love them. They are very cute on my tree! Good quality and fast shipping! 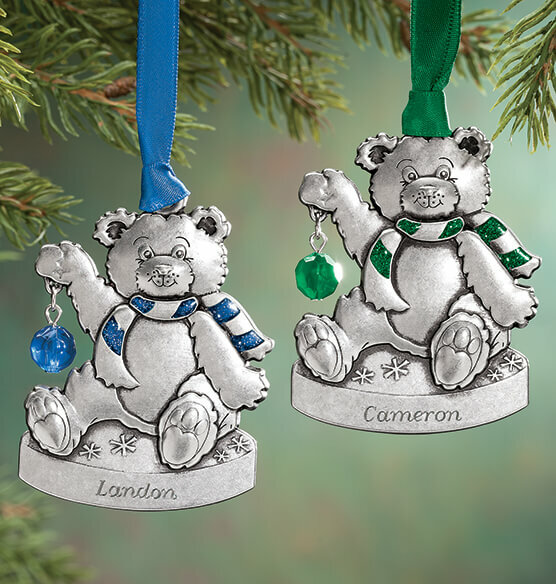 The Birthstone Bear Ornament is so cute and is just the right ornament for my 2 year old grandson's Christmas. It has has his birthstone and he's going to love it. Great to be able to get the kids names correctly even though they are different. Love it and beautiful color of birthstone with engraved of my daughters names. I bought these ornaments for each of my Great Nieces and Great Nephews. I did get the engraving. I wish it would have been done a bit bigger. Other wise it is a great ornament. I had this item sent direct to my granddaughter. She said it was pretty. I've ordered ornaments from you before each time a new baby is born. Baby's first Christmas. She always liked them. Yes I would buy them again without the personalization. 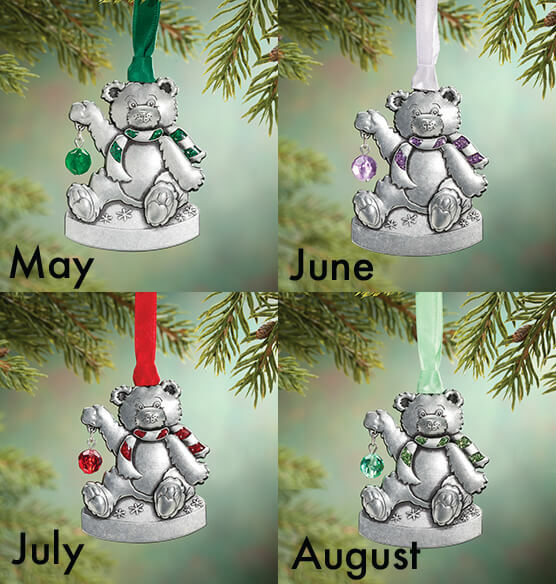 I tried to order these birthstone bear ornaments for all of my grandchildren. However, I could not order one for my grandson who was born in July because the birthstone was incorrect for July. It was blue colored; the ribbon was also blue. July's birthstone is a ruby, definitely a red color. All of the others showed the correct birthstones and colors when I ordered them. I admit I was late in getting them ordered so I didn't have time to call and question the company about this. Luckily, this grandson was celebrating his first Christmas so I could order that type of ornament instead, but still it was disappointing to me that I couldn't get one that matched the others. I also was disappointed that the inscriptions on the ornaments were very light and very hard to read. You have to turn the ornament this way and that in order to read the name on the bottom. I will probably see if I can darken the names somehow after we take down our Christmas tree. If I can get a correct one for my grandson, I may order one more in the future, but otherwise I won't be ordering things like this again. I love the accent of the birth stone on the ornament; however, my name is the same color of the ornament which makes it difficult to see my name. I think the name should be done in the birth stone color. I ordered this ornament for a friend, who had a new baby. I haven't given it to her yet, and I may not. The engraving is so light , that it is hardly legible. I would love to return it , and get it redone, or even get a different ornament, but they have a no return policy on personalized items. I would sadly not recommend this item. However, some of the other ornaments that I have ordered, had great engravings. I guess it is just a gamble ! Every year I buy an ornament for my great nieces and nephew, really cute ornament but don't waste your time getting it engraved, can't see the name, and it is a very small print! This was ordered for my grandson and the name is not legible! A real dissapointmet! Cannot read his name! I plan to give this to my grandson for Christmas. The engraving of his name was so poor, it's barely noticeable. I'm considering scratching it out and just writing the name in with a magic marker. The personalization was ver small, slanted and very hard to read. The ornament itself was Bernice pewter but the personalization was very poor. Don't bother having this personalized, if you plan on purchasing this. I can't even see the name that I had engraved. It's too small and shallow. I purchased these for my 4 grandchildren and was so excited to get them personalized ornaments as their names are not common and I can never find them printed on things. The engraving is barely visible and it you get it at an angle where you can actually see it, it looks very unprofessional. Jagged looking and 2 names are very crooked. Very disappointed in this purchase!